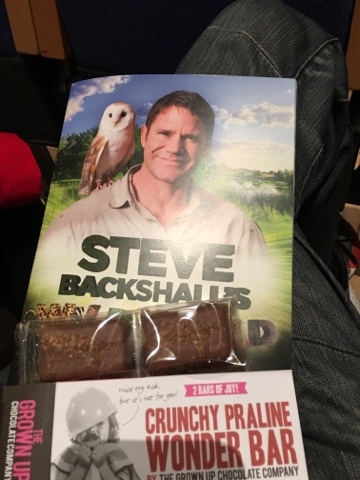 Recently we went to see the wonderful Steve Backshall do a talk about how wonderful nature is and I took along a snack for the interval. I'd picked this up at a service station a few weeks before and saved it up for when we needed a little something to nibble on. In the box you only get two of the little bars, but if there are only two of you then this is fine. Inside it's quite a soft but gritty praline with enough melty smoothness to give the flavour a big boost. I don't think these are quite as luxurious as they make out from the packaging but they certainly are nice. 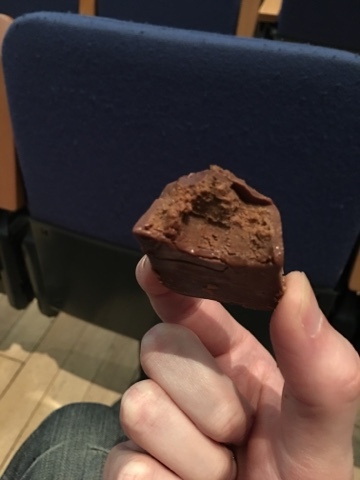 The range is really varied with lots of variations on the chocolate and a filling theme and I'd certainly be willing to try a few more to see whether they are the magical one. Lovely Steve was really entertaining and informative, and we got to meet him afterwards at the signing.